The lovely ski and leisure resort of Auron awaits you! At 1700m Auron offers a playground for both winter and summer. At just over an 1 hour from Nice airport and situated in the southern Alps, Auron is easily and quickly accessible. This spacious chalet is built in traditional Alpine style and can accommodate families or a group of friends wanting to experience the pure mountain air in the summer, or the thrill of skiing 135km of pistes in the winter season. Auron is a ski resort located in the south of France, in the Alps close to Nice, just an hour and a quarter from Nice Airport by car. If you prefer, you can charter a helicopter to take you to the resort and be whisked there in a few minutes. Auron is one of the communes that make up the National Park of Mercantour, one of the wildest spots in southern France. Mercantour is now famous for its wolves, reintroduced about 25 years ago, and its impressive ornithological variety. Here, you will almost certainly see vultures and eagles, and if you are lucky you might catch glimpes of marmots, chamoix and the rare mouflon sheep. The resort is as beautiful in summer as it is in winter. The great thing about Auron is that it is so close to the Cote d'Azur, you could go skiing in the morning and Mediterranean swimming in the afternoon! The village (created in 1937) is at 1700 meters altitude. The ski area includes about 135 km of piste, culminating at 2400 meters above sea level. 42 tracks (3 green, 16 blue, 15 red and 9 black). 21 lifts. 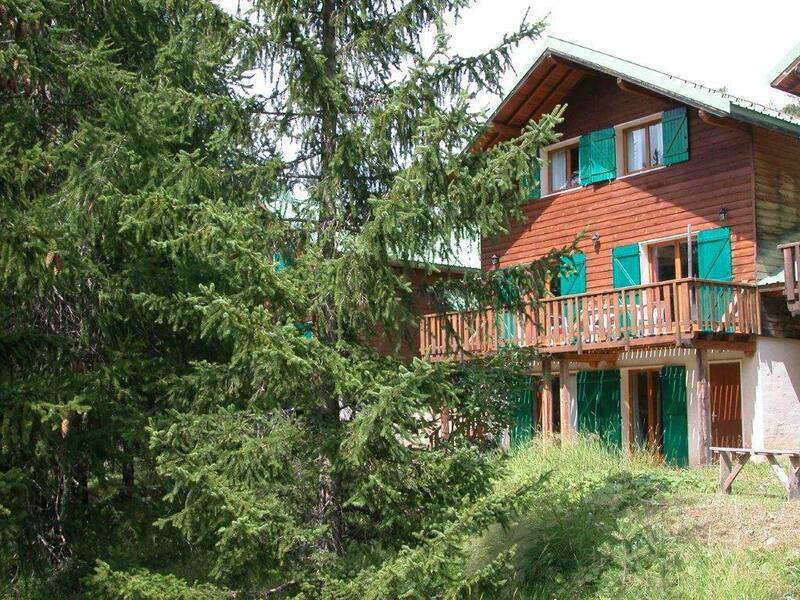 We are pleased to offer this lovely chalet built in the traditional Alpine style. It is deceptively spacious inside (220m²). Located in the Chemin des Colettes (on the east side of the village) it is 800 metres from the center of the village. The chalet is south-west facing so catches the sun and sunlight. There is a terrace with a dining table with chairs and two loungers. A barbecue is available. In Auron during the summer: Half of the restaurants of the village are open in July and August, and the biggest activity is from 15th July to 15th August. Sports shops with mountain-bike and electric mountain-bikes rentals. Many outdoor sports activities all around, and very nice hikes with lakes or rivers. The mountain-bike activity is very well organized. Also canyoning, mountaineering, horse riding, etc. Also a 9-hole short golf course with driving range. A nice outdoor heated swimming pool. A cinema with the latest movies (in French). In Auron during the winter season: All the restaurants in the village and on the ski slopes and all the shops are open. Ice skating in the center of the village , on the main square. The chalet has 5 bedrooms and 3 bathrooms and sleeps 12 in total. A cloakroom and a toilet. A living / dining room and open kitchen. A double bedroom with its bathroom. A laundry with washing machine and dryer. Five bedrooms + three bathrooms to sleep 12 people. Auron, in the Mercantour National Park, about 1 hour 15 minutes from Nice airport. July and August, and the biggest activity is from 15th July to 15th August. rivers. The mountain-bike activity is very well organized. Also a 9 holes short golf course. With a nice practice space. Electricity: Summer 90€/Winter 180€ per week. End of stay cleaning 200€. The chimney place offers the possibility for barbecuing, or there is another BBQ for the terrace.